Explanation: This wide, sharp telescopic view reveals galaxies scattered beyond the stars and faint dust nebulae of the Milky Way at the northern boundary of the high-flying constellation Pegasus. Prominent at the upper right is NGC 7331. A mere 50 million light-years away, the large spiral is one of the brighter galaxies not included in Charles Messier's famous 18th century catalogue. The disturbed looking group of galaxies at the lower left is well-known as Stephan's Quintet. About 300 million light-years distant, the quintet dramatically illustrates a multiple galaxy collision, its powerful, ongoing interactions posed for a brief cosmic snapshot. 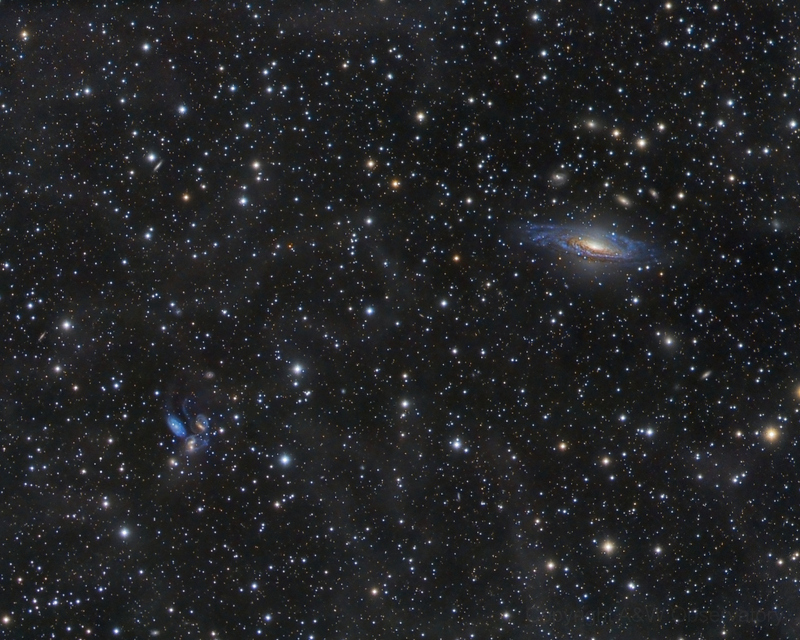 On the sky, the quintet and NGC 7331 are separated by about half a degree.